Skipping breakfast and overeating in the evening have been shown to play a significant role in weight gain and obesity. A study in the journal Obesity found that consuming the heaviest meal of the day at breakfast and the lightest at dinner can lead to significant weight loss. From June to October 2012, researchers at Tel Aviv University in Israel recruited 93 overweight and obese women to participate in a three-month, 1,400-calorie-a-day diet, an amount recommended in some weight-loss diets. The women were in their mid-40s and had metabolic syndrome, the term for a cluster of health conditions associated with Type 2 diabetes. Half the women were assigned to a breakfast group (BF) that consumed 50% of the allotted daily calories at breakfast, 36% at lunch and 14% at dinner. A dinner group (D) did the opposite, eating 14% of calories at breakfast, 36% at midday and 50% at dinner. Participants were measured for various body and metabolic markers every two weeks. The BF subjects lost an average 19.1 pounds over 12 weeks, while the D group shed 7.9 pounds. BF subjects trimmed 3.3 inches from their waistlines compared with 1.5 inches in D group; body-mass index dropped 10% and 5% in the BF and D groups, respectively. Average triglyceride levels, an indicator of cardiovascular health, decreased by 34% in BF subjects but increased by 15% in D subjects. Total cholesterol slightly decreased in both groups but HDL levels, the so-called good cholesterol, increased significantly only in the BF group. Levels of glucose, insulin and ghrelin, an appetite hormone, decreased significantly in both groups but to a greater extent in BF subjects. The BF group also had significantly lower glucose and insulin responses in post-lunch blood tests, suggesting that eating a relatively high-calorie breakfast helped to maintain stable insulin levels after the second meal of the day, researchers said. Caveat: The study was too short to determine the long-term health benefits of high-energy intake at breakfast, they said. Reduced hunger. Eating breakfast may reduce your hunger later in the day, which may make it easier to avoid overeating. When you skip breakfast, you may feel ravenous later and be tempted to reach for a quick fix — such as vending machine candy or doughnuts at the office. In addition, the prolonged fasting that occurs when you skip breakfast can increase your body’s insulin response, which in turn increases fat storage and weight gain. In fact, skipping breakfast actually increases your risk of obesity. Healthy choices. 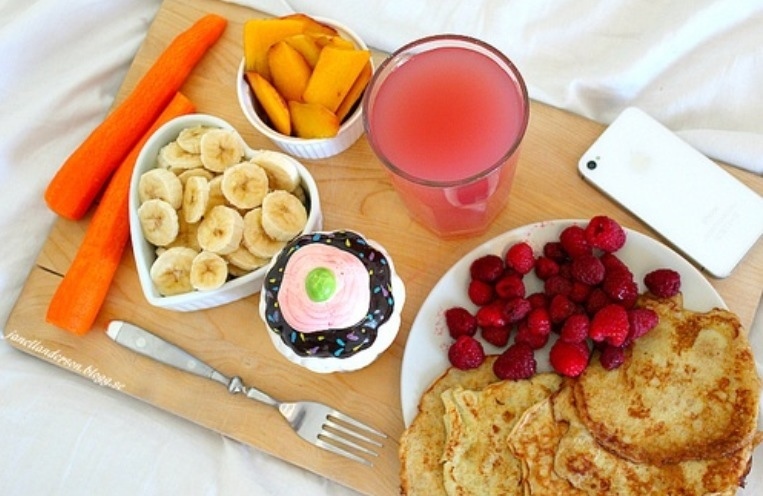 Eating breakfast may get you on track to make healthy choices all day. When you eat breakfast, you tend to eat a healthier overall diet, one that is more nutritious and lower in fat. When you skip breakfast, you’re more likely to skip fruits and vegetables the rest of the day, too.